Let us just rewind back to the distant past that was the summer of 2012, the mighty Eintracht had just been promoted at the first time of asking back to where they belong, the Bundesliga. The city was full of optimism that they were in it for the long haul and that they would not continue to “Yo-yo” between tiers. What transpired over the next 12 months could have only been dreamt of by most at the start of the campaign. Eintacht Frankfurt, led by the experienced Armin Veh, had finished 6th- qualifying for the Europa League with qualification to the Champions League remaining a distinct possibility until the very last day. During the season, many had feared that this brilliantly assembled squad from Armin Veh would be torn apart, including Veh himself leaving for yet another club. He and Sebastian Jung were both rumoured to leave ‘die Adler’ in favour of Schalke while Sebastian Rode was heavily touted to leave this season for a lucrative move to Pep’s Bayern. Instead, Veh and Jung both signed a contract extension keeping them at the club until 2014 and 2015 respectively. This has left Eintracht in a very comfortable situation, with the complete first team remaining intact while being strengthened with numerous very shrewd signings. Of the many new many faces, perhaps the biggest coup of Eintracht’s signings was the signing of Freiburg duo Jan Rosenthal and Johannes Flum, the latter coming for a fee of approximately €2.2m. Flum and Rosenthal are coming on the back of an equally impressive campaign under the brilliant Christian Streich in which he led them to a 5th place finish in the Bundesliga, sneaking past Eintracht to earn automatic qualification to the group stage of the Europa League. However, Flum and Rosenthal decided to leave Germany’s ray of sunshine for the financial capital of Europe due to the fact Eintracht have “better long term prospects”. An area that Frankfurt relied upon heavily this system was definitely their midfield- having to count upon the fitness of captain Pirmin Schwegler and Sebastian Rode. 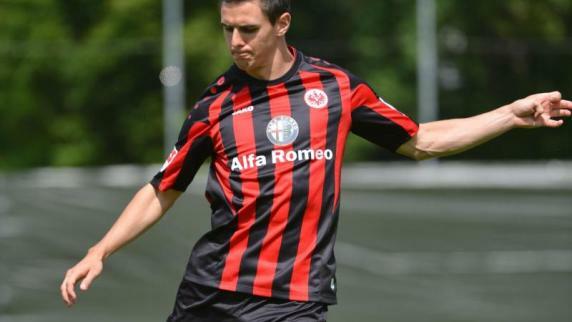 During the 2012/2013 campaign, Frankfurt only won 1 of the 7 games in which Schwegler missed. With Flum added to the squad, they have yet another option to count upon who can cover for Schwegler and Rode as well as being another option at Centre Back. Rosenthal adds yet another option to the arsenal of attacking options that Veh has at his disposal coming off the back of amongst his best seasons at Freiburg scoring 4 and assisting as many in 18 starts. Other signings include Marvin Bakalorz (former BVB II captain) and Marco Russ who they signed on loan initially in the January transfer window. Both players are not expected to start much but this does help Veh hugely with the upcoming ‘Doppelbelastung’ (Double workload) that is the Europa League and these two squad players should be able to help Veh rotate what was a very thin squad as and when he desires to do so. Finally, the last 2 new signings of note were the duo from Hoffenheim- Joselu and Stephan Schroeck, the latter adds much needed depth to the wings as cover for Inui and Joselu will compete with Lakic and Rosenthal to start up front. Joselu disappointed hugely in his first season in the Bundesliga, scoring only 5 goals. Whether this can be attributed mainly to poor overall quality of his teammates is debatable as their form started to pick up as he fell out of favour. As it stands now, Veh has the same first team as he did last year, with added depth to coincide with the strenuous extra workload, however they may at points struggle for goals due to the lack of proven quality up front- Veh has other options, for example he has in the past experimented with Aigner and Inui playing up front but there is a need for one more attacking player. That player is Vaclav Kadlec- known to be Veh’s “Wunschtransfer”. Kadlec himself has also said that he would “definitely want a move to Frankfurt”- the only problem is the fee. Sparta wanted €4m for him while Frankfurt were only willing to pay €3m for his services. Veh has remained patient (Certainly unlike Veh), and he was rewarded when Sparta conceded 2 away goals in Europa League qualifying putting their place in the competition in jeopardy. However, just a few days later it was announced that Kadlec had signed a new deal with Prague keeping him at the club until 2016. Is that the end of this saga? Not at all, Prague have indeed failed to qualify for the Europa League meaning “serious consequences” financially for the club, it is also heavily touted that there is a clause in the new contract to cope with this scenario. Kadlec can add depth to the wings as well as playing up front, enjoying the ability to create and score goals. Not only that, but he has pace and is very good in transition. The central midfield this season will once again be absolutely vital for Frankfurt, Rode and Schwegler add stability to the defence and link up incredibly well with the wingers. Frankfurt are also known to like to keep the ball (averaging around 54% possession a game) which is due to the strong ball retention skills of the two holding midfielders. Two players who have attracted much attention due to their incredible season last year are Bastian Oczipka and Sebastian Jung, with clubs like Sunderland and Schalke reportedly interested in them. If there was one thing that Frankfurt relied upon more than their midfield, it was their wing play. Oczipka and Jung are very offensive minded fullbacks, further proven by Oczipka’s impressive assist tally (10); they often link up with more central players or help Aigner/Inui with attacks down the wing- in order to continuously feed cross, mostly good ones too, into the box for a target to head in. The only problem is that Frankfurt haven’t got much depth in this particular area and are reliant on both staying fit- and as we saw last season, Oczipka became seriously fatigued during the season and as a result his level dropped. Finally, Veh needs to show his commitment. Veh has a tendency to get up and leave at the first time of asking when things don’t go his way, this is why his managerial history looks like an illustrious ‘Hop on, Hop off” tour round Germany. If Kadlec is not acquired, and results are slow at first, he needs to stay loyal to the team that got so far this quickly and stick with it. Sufficient depth was added and he has numerous talented young players to call upon (one less with Stendera injured long term) such as Marc-Oliver Kempf and Gian-Luca Waldschmidt and the ever reliable goalkeeper who I’ve not credited enough, Kevin Trapp. Although ‘die Adler’ suffer from a slightly larger workload this season, I believe that with the depth added that Veh’s team can achieve a spot in the upper mid-table region (around 8th-10th) and if they acquire Kadlec, perhaps the can build upon the success of last season. What we do know is that they kept their squad, have added to the squad and have the young players to add even more to the team led by an experienced manager like Veh. Bayern Munich : A season of Great Expectations for FCB?